Maybe I shouldn't write this post from the airport after having a bumpy journey here but now is when I feel about saying what I thought about Moscow. The city is huge – even the city centre is quite big and the architecture is quite grand making a city beautiful to look at. 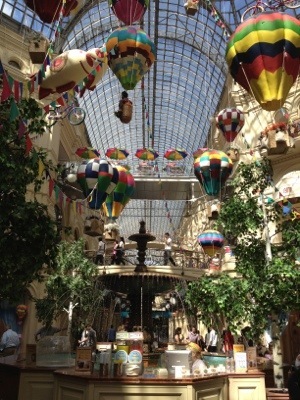 It has impressive constructions but it is not tourist friendly at all. Almost no signs in English or any other language. People are extremely unfriendly and nobody speaks in English even on touristic attractions. Be very well prepared to lead your own way. Sight Seeing: there are a few places to go visit. I didn't have a chance to go in in most of them but I can give you an idea. 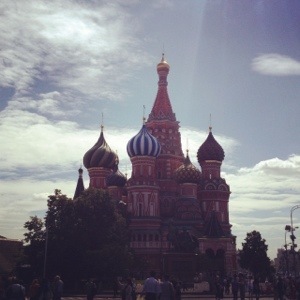 Red Square: obviously a must. Very nice to sit at Bosco Cafe for a drink and people watching. Tretyakov Gallery: supposed to be the best one if you are going to choose one to visit. It is mainly paintings of Russian artists. 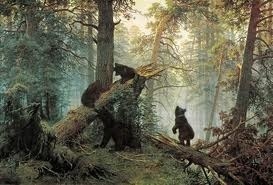 Here you will see the very famous painting of the forrest with bears by Shishkin. Bolshoi Theatre: you can't visit unless you have a ticket for a performance. Impressive building from the outside. Kremlin: worth having a look. Very impressive from the outside and it is supposed to be good inside. Make sure you know what you going to visit inside or get the audio guide. Cafe Pushkin: super famous and busy. Needs a reservation. Very beautiful place with good food but quite expensive – £70 per person w no wine. Transport: very easy to get to town from airports. All have Aeroexpress trains. Metro is quite wide but all in Russian. Returnability: zero. Not coming back. Gone, seen, done.